The process of transforming a landscape can seem daunting, but at Wild Bloom we have nailed it down to a straightforward and simple system that takes your yard from… well, let’s just say less than ideal.. to a professionally crafted outdoor environment. Follow along as we take you through this project profile to learn how it’s done. 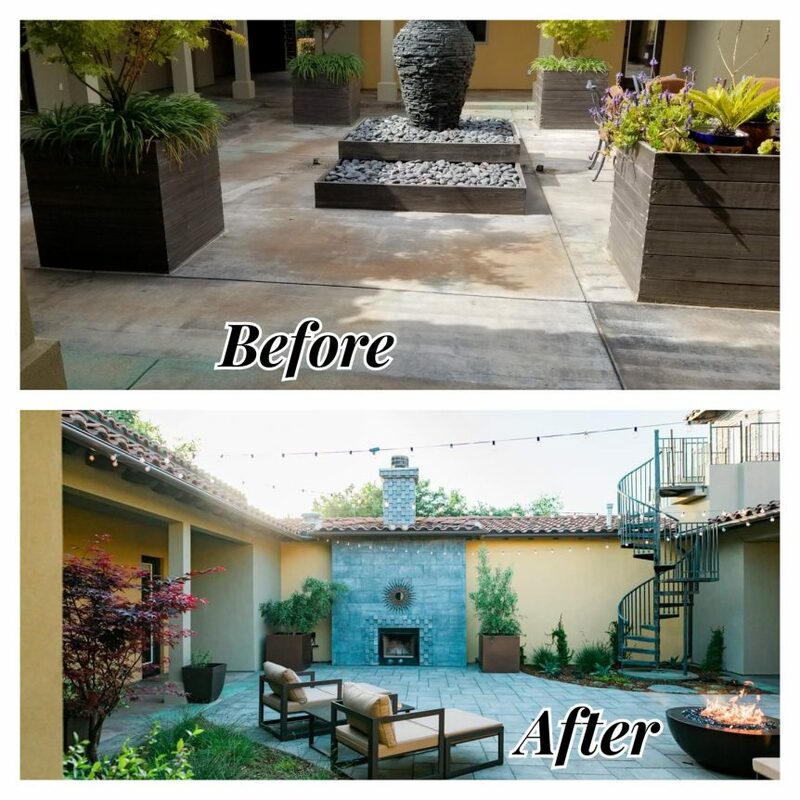 This courtyard patio in Arroyo Grande needed a makeover. It was unused and, frankly, uninviting. Our clients wanted a space that would feel like a seamless extension of their home. They wanted it to feel like a second living room, only outdoors. Our client for this project called us up after being referred by a previous client we had done work for earlier in the year. During this first phone call, we ran through his needs and goals for the landscape. We discussed things like his family’s intended use of the space, problem areas, budget, and our process. After the phone call, the first step is to have an initial consultation. For this consultation, our clients had some sketches of ideas they liked for the space. Visual aids are always helpful since it gives us a clear picture of your style and tastes. We walked through the courtyard and discussed different options for paving materials, hardscape layout, plants, and accessories. The courtyard was already a fairly nice space, it was just mostly unusable and felt unwelcoming. Hardly a space the family would want to spend their evenings. The floor was paved with concrete and slightly lowered. There were 4 large wooden planters with various trees and plants in them. In the center there was a large fountain that never got used. Our clients had a small table and chairs stuffed between all this to try to make some sort of usable space for themselves to be outside. The courtyard was set up more like a large wide hallway than a functional outdoor room. After discussing initial ideas, materials, and layout options at the consultation, it was time to get to work on the design. The first thing we do during the design process is gather as much information as we can about the clients tastes, wishes, needs, problem areas, budget, etc. We send a detailed design questionnaire and have a designer meet with the clients to discuss specifics. We also perform a detailed site analysis to determine current conditions and project dimensions. This stage is all about getting to know our clients and their property so that we can customize the plans to meet their needs. After gathering all this information, we set about creating the design. For this project, we wanted to make the courtyard an effortless extension of the interior of the home. We wanted it to be a welcoming outdoor room that would be comfortable and easy to spend time in. Right away we knew the fountain and raised planters had to go. They were not in excellent shape and took up way too much room. We also wanted to change the paving material. The concrete felt too “cold” and was the same as all of the other concrete on the property including the driveway and sidewalks. This added to the “hallway” effect, making it feel less like an actual room. We also decided to raise the elevation to be level with the doors leading into the house. This would make for a more seamless transition from the indoor rooms to the new outdoor room. The paver we chose was Belgard’s Lafitt Rustic Slab. It worked with the architecture and style of house, yet provided a bit more of a natural look. To make the space feel more welcoming, and to add a sense of softness to the hardscapes, we shaped the patio space to include planting beds. We also included several decorative planter pots throughout the courtyard. 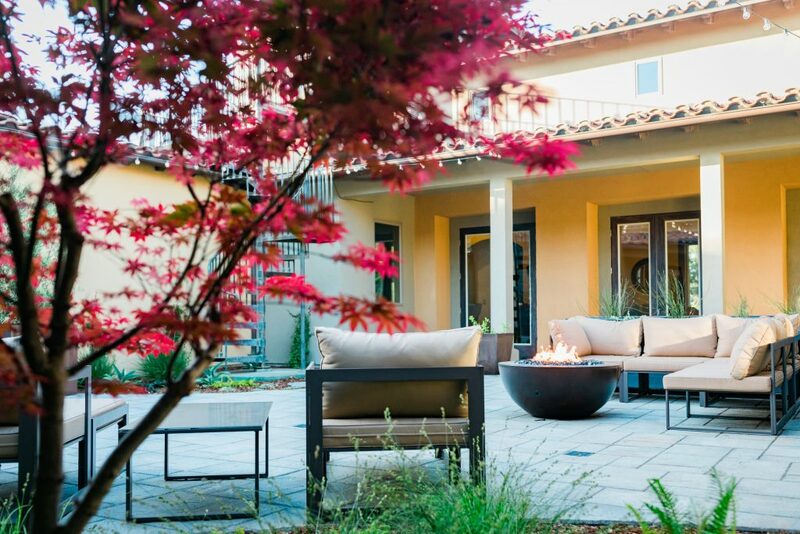 The courtyard also included fire features to gather around and make the space usable even on cool nights. 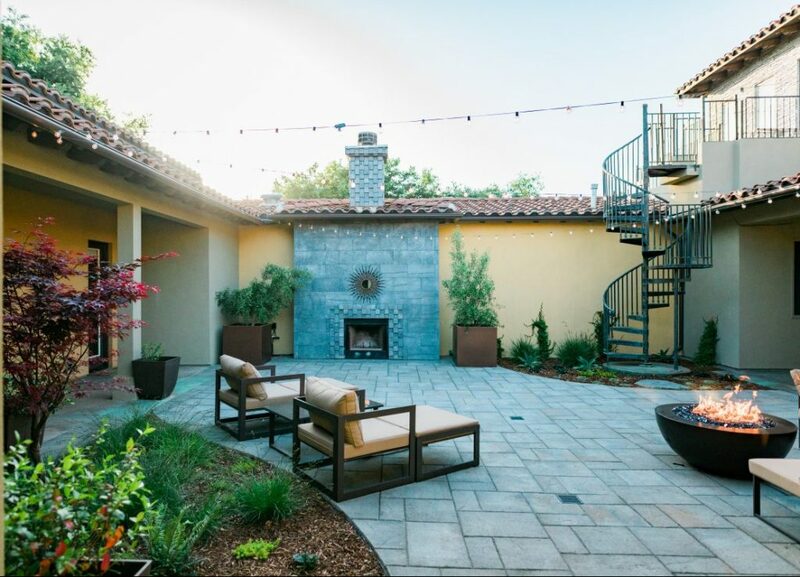 For the fire bowl area, we added comfortable new patio furniture and backed the space with a narrow raised planter to give it a sense of enclosure and coziness. Artwork and outdoor lighting was added throughout the landscape to provide additional accents and make the space more dynamic at night. After presenting the design and scope of work for the project, it was time to prepare for construction. Installing a landscape is extremely satisfying after having the design created because it’s almost magical how the details on the plan come to life. One day you’re looking at the landscape on a piece of paper, then before you know it you are relaxing on your new patio! Once the landscape installation is scheduled, we start our preparations. Plants, pavers, aggregates, mulch, artwork, furniture, and more were ordered so that the construction phase would go smoothly. Leading up to the start date, we always have a pre-project meeting between our Foreman, Project Manager, and Designer. This allows everyone to be on the same page about the work to be done and our plan of action. Once we started this project, the first step was to do the demolition. Almost everything in the courtyard was going to be torn out to make way for the new landscaping. The fountain was removed, the planter boxes were disassembled, and the concrete surface was jack hammered out. It took several days just to get to where we could start building. Since the courtyard was going to have pavers installed for the patio, we needed to first get all the utilities in. Drain lines were installed along with water, gas, and electrical lines. These were all stubbed out to where we would need them to be after the patio was in. The next step was grading and building the base for the pavers. The base was a thick compacted layer of aggregate with a sand setting bed for the pavers. The base of a patio is critical to its long term durability. If a patio base is not built right, patio pavers will quickly become uneven and disjointed. We take special care to make sure the grading is precise and the base is fully compacted. 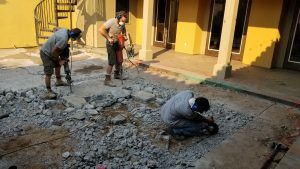 With the base built, we started to lay the pavers. It’s exciting to watch the pavers go in because you can finally start to see exactly what the new patio will look like. 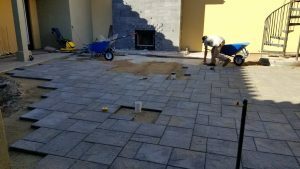 The pavers for this patio went in fairly quickly because they were on the larger size and required minimal cuts to fit the space. After the pavers are laid down, we apply polymeric sand to seal the joints and do our final compaction to set everything in place. After the pavers were in, it was time to build the raised wooden planter that would serve as a backdrop to the fire pit area. We constructed this from redwood lumber and stained it to match the hues of the courtyard. Irrigation line and conduit were installed in the planter box to ensure we could get lighting and water around the plants. Planting came next. In addition to the two in ground corner planting beds, we also brought in quite a few planter pots to accent the courtyard. 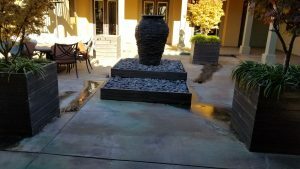 We installed drought-tolerant grasses, shrubs, and perennials to soften the hardscapes and give the patio a lush, welcoming look. We also installed vines that will grow up the courtyard pillars and walls. Irrigation was installed to all of the new plants and we put in accent lighting on the Olive and Japanese Maple trees, as well as in the raised planter box. Now that the plants were in, it was time for the finishing touches. 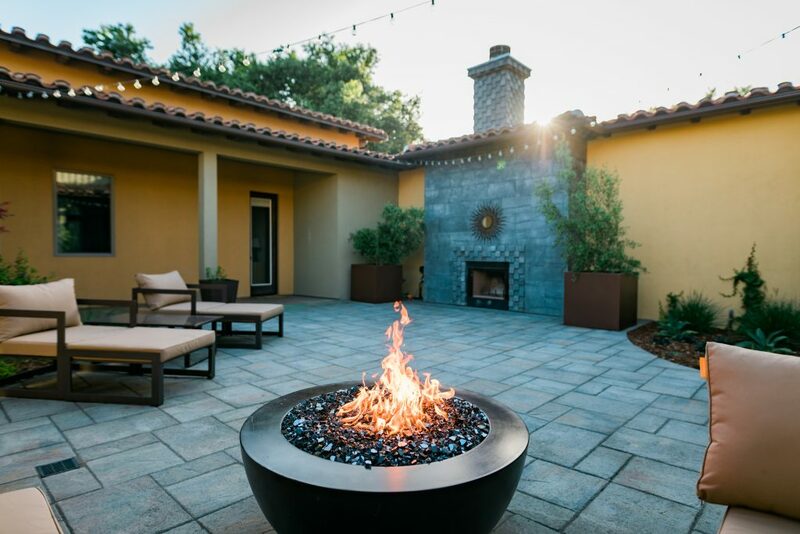 The fire features were completed, artwork was placed, and the patio furniture was assembled and set up. These final steps really took the space from a nice landscape patio area and made it into a comfortable outdoor room. The courtyard now felt fully like an extension of the home. With the project complete, our clients now had another room in their home. They have a place to relax outdoors and enjoy comfortable central coast evenings by the fire. They have a new spot to kick back with a newspaper and a cup of coffee in the morning. And finally, they have a space where they can gather with friends and sip wine on the weekends. Our clients were happy to report they are now using the courtyard way more than they ever have in the past! 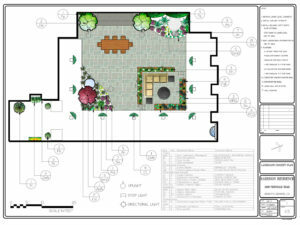 As you can see, our 3 step Consultation, Design, and Construction process makes navigating your landscaping project simple and less intimidating. We gather as much information as we can about your vision, style, and objectives, then make it come to life! 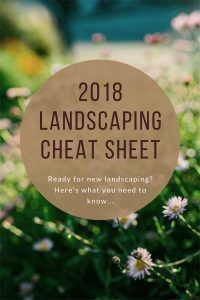 If you’d like to get started on your new landscaping project, feel free to contact us for a free project assessment so that we can learn how we can best help you reach your goals.